Michel Chignard is a modest perfectionist who has been practicing his craft for 4 decades. His son, Cédric, now oversees the domaine with as much care as his father. The Chignard family is fortunate to own vineyards in one of the best sites of the Fleurie appellation in Beaujolais; “Les Moriers” is a 8 hectare parcel that extends into Moulin-a-Vent territory. These 60 year old vines have roots that run deep accessing minerals from the granite subsoil thus imparting that classic Fleurie freshness and “gout de terroir”. This is Gamay from the Cru of Julienas. This Northern Beaujolais appellation was the site of ancient Roman vineyards and was named after Julius Caesar. The granite, volcanic and clay soils of Julienas impart power and structure to the wine and therefore, wines from this cru are often capable to develop in bottle. 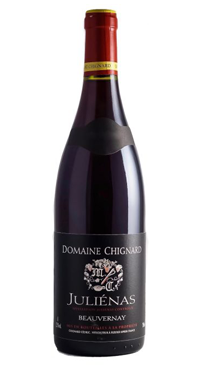 Domaine Chignard’s Julienas Beauvernay is made from hand harvested Gamay grapes. Vinification is natural and traditional; whole cluster fermentation in cement and stainless steel. The grapes are pressed after 6-8 days in vats. The wine is then aged in old oak barrels for 13 months, blended and bottled unfiltered and unfined. This is a gorgeous floral and fruity red; with aromas and flavours of strawberry, peach, violet and baking spices.